Springfield Auto & Truck offers a full line of utility/service bodies, crane and crane bodies. 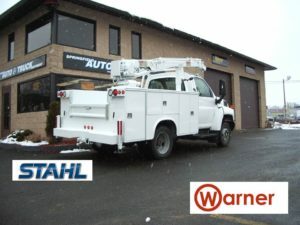 We provide quality utility/service bodies manufactured by Stahl, Warner Truck Bodies and more. Whether you lift, store, dump, chip, or haul, Springfield Auto & Truck can provide quality product installation solutions to meet your needs! Whether it’s medium or heavy duty service bodies, crane bodies, van bodies, dump bodies, cranes and Back Paks, Springfield Auto & Truck can help! Check out our photo gallery for ideas! 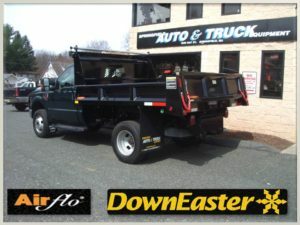 Springfield Auto & Truck is a distributor for Downeaster dump bodies and hoist systems. We stock 9’ Downeaster dump bodies painted black, ready to go. Springfield Auto & Truck is also an Air-Flo dump body distributor that offers mild steel and stainless steel body options. We have many dump body options available, replacing existing bodies and new installations. Electric and central hydraulic options for powering dump bodies, tailored to your custom needs are also available. Springfield Auto & Truck also has many dump body accessories, complete tow packages, slide-in receiver plate style or bolt-on pintal hitch plates, reinforced to the truck frame for towing. Roll tarps are a necessity on most dump bodies. We offer a complete selection of manual and electric tarp systems.